Our tailor-made Golden Triangle tour packages give you a once in a lifetime opportunity to discover the culture and heritage of three of the most popular north Indian cities: Delhi, Agra and Jaipur. On your arrival at Delhi Airport, a representative of Shine Gold Tours India will be there to welcome you and take you to your hotel. After getting some rest, start your Golden Triangle tour from Delhi, by visiting tourist sites such as Qutub Minar, Red Fort, Humanyu tomb, Akshardham temple, Jama Masjid, India Gate and Lotus Temple. Drive to Agra in an air-conditioned car. This is only a two-hour drive (165km) from Delhi if we go through the expressway. 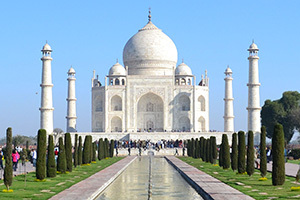 Agra has been the most popular tourism destination in India for many decades. Start sightseeing in Agra by visiting Agra Fort, which was built by Emperor Akbar in 1566. There are two sections in the fort: one is called Diwan-I-Am, which is a big hall made of red sandstone where the Emperor Akbar used to hear public petitions. The other is Diwan-I-Khas. Here the emperor used to have meetings with foreign ambassadors and rulers of other states. View the magnificent Taj Mahal at sunrise and sunset to take in this marvellous monument’s different colours. Taj Mahal, Agra Fort and Fatehpur Sikri are the three World Heritage sites in Agra. Taj is also included in the list of the seven wonders of the world. The second destination of the Golden Triangle trip is Jaipur (also famous as the Pink City), the capital city of Rajasthan. It was named after the King Jai Singh. Beautiful palaces, forts, gardens and temples are the major tourist attractions of the Jaipur. Visit the City Palace, which is a beautiful palace complex (and now also a museum) built by Raja Man Singh in 1729. Jantar Mantar is an observatory built in the 18th century by Maharaja Sawai Jai Singh II to study the movement of constellations and stars in the sky. Hawa Mahal was made for the royal ladies to watch and enjoy the activities on the street. It has 152 windows with overhanging latticed balconies. Jal Mahal is yet another beautiful palace situated in the Mansagar Lake. The mighty Jai Garh Fort stands on a hilltop and overlooks the palaces and forts of the city. Major temples and religious places in the city are Birla Temple (made of white marble), Govind Dev Ji Temple, and Moti Dungri Temple. We will also show you the majestic Amer and Nahargarh forts. After sightseeing in Jaipur, we will drive you back to Delhi to end your Golden Triangle tour package.